A Splintered Mind: Free Book Friday. Swine Flu Not Included. Free Book Friday. Swine Flu Not Included. I’ve got another free book for you today, but you might not want it. My wife has come down with the Swine Flu. No, she hasn’t sneezed & coughed all over the books. Actually, my wife is allergic to reading—gives her hives. She stays away from most literature (although recently she read a street sign. We were very excited for her). That means your free book would be safe, but I’ll soak the book in disinfectant before I mail it to you just to put your mind at ease. I was amazed, however, at the manner in which the hospital treated my wife. There wasn’t any emergency room staff within sight and they apparently treated her via intercom. A stick holding a mask was pushed her way from someone hiding in the ceiling. She was in and out within twenty minutes. In fact, they pushed her through so quickly they didn’t even bother to take her co-pay. I suggested that she use this to her advantage from now one. You may find it useful, too. Got a broken leg or ruptured spleen? Just tell them you also have Swine Flu and they’ll patch you up for free in a jiffy and in under 30 minutes. Now there’s a healthcare solution that all parties can agree upon. I spent the week being sick myself, though I don’t have hooves for feet or a curly, stubby tail like my wife has. Although I didn’t manage to write much of anything in my current book, I did manage to get out to a downtown mall before the illness settled in. I had promised my friend, Bree Despain, that I’d say “Squee!” in public in exchange for an advanced copy of her upcoming book. When we waited in line together to see James Dashner last week, I reminded her of this. If you need proof that I have a lack of impulse control, you will be pleased to learn that Bree somehow talked me into wearing purple nail polish while I publicly squeed. Online proof of the deed was also tossed into the pact. It seemed like a good idea at the time, but later I began to curse my ADDled mind. Unfortunately, Bree was quite excited about me doing it. It seemed she liked the idea so much that she worked it into a contest. I was committed. Sunday night I found myself contemplating how on Earth I was going to appear manly while saying “Squee!” with purple fingernails. I don’t plan on making you do such elaborate things for today’s free book. Just answer the following questions in a comment below. I’ll pick a name at random on Monday. 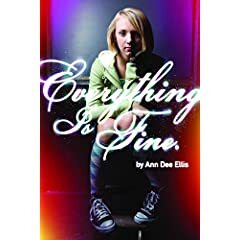 The winner will get Ann Dee Ellis’ “Everything Is Fine” —a fabulously & creatively written story about a young girl who is forced to swap roles with her critically depressed mother. Would you have painted your nails purple and squeeeeeed in public for a copy of The Dark Divine? Are you convinced I have a terminal case of AD/HD yet? Ever do anything more embarrassing than this, and was AD/HD involved?